We arrived in Missoula about noon and straight off we headed for downtown to find coffee, a snack and an internet hot-spot. Then, crossing the Clark Fork River, we headed out of town following the Lewis and Clark Trail to Lolo Pass on the Montana/Idaho border. The Lolo Pass Visitor Center is a modern interpretive center surrounded y wilderness. We crossed part of the Lolo and Bitterroot national forests in Montana and found ourselves at the edge of the Clearwater and Nez Perce National Forests in Idaho. This wilderness area is big (9,767 acres) and that’s where you go to see trees, lots of them. This area was preserved besause of the actions of presidents Jefferson and Johnson. In 1803, President Jefferson commissioned Meriwether Lewis and William Clark to find the Northwest Passage, and then in 1964, President Johnson signed the Wilderness Act, which led to the creation of this huge wilderness area. 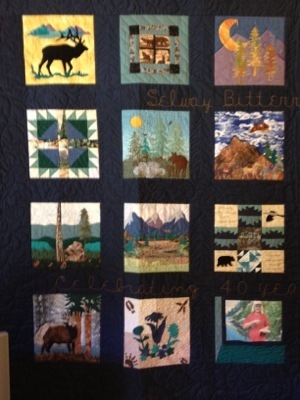 In 2004, 40 years after the signing of the 1964 Wilderness Act, a group of Idaho and Montana quilters created a hugh commemorative quilt that hangs in the Lolo Pass Visitor center. Each square was sewn by a different quilting guild member. After a walk around the nature trail, which doubles as a cross-country ski course in the winter, we headed down hill back to Montana for supper– Salmon salad, bread, grapes and a cookie for desert. 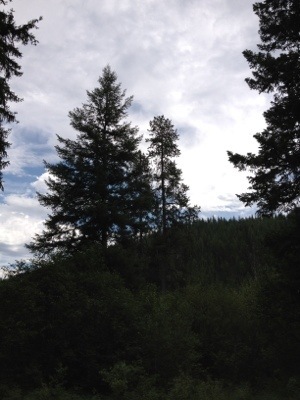 This entry was posted in Montana, Travel Blog and tagged iPhone, Lewis and Clark, Montana, Travel, Vacation by carto. Bookmark the permalink.